‘Superfoods’ is a widely used catch-all phrase used in the marketing of exotic (and normally expensive) fruits and vegetables. But just what exactly makes a food ‘super’? 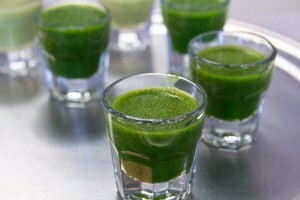 ‘Superfood’ has no meaning among nutrition scientists – the people that know the most about the science of food. 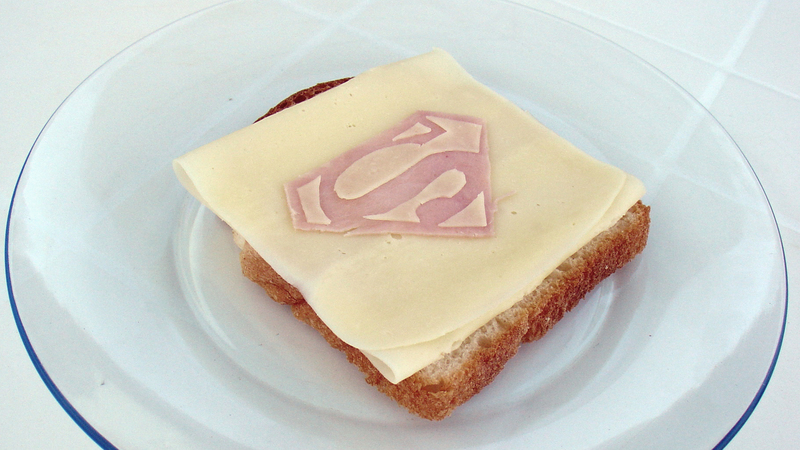 The word has no legal definition, so anyone can label any food they are promoting as ‘super’. No debate that foods like broccoli, soy, fish, oats, blueberries, garlic and tea all have lots of great health benefits, but these aren’t the focus of this article. There isn’t a lot of profit to be made by marketers in promoting these foods. It is the superfoods that are attached to a large amount of marketing hype with promises of all sorts of extraordinary health benefits, but coming at a very expensive price premium, that I want to focus on. Goji berries, also called wolfberries, are the common name for the botanical species Lycium barbarum. The berry is widely grown throughout Asia, though most of the commercial marketing for goji focusses on varieties originating from Tibet. The Internet abounds with extraordinary health claims attributed to goji berries including anti-cancer activity, anti-ageing properties, improving vision and enhancing fertility. Few human clinical trials of any quality have been conducted to support these claims. Distributors of goji berries point to hundreds of studies that can be sourced from medical journals to back up their claims. Closer scrutiny shows that almost all of these research studies were done in cells grown in laboratories or animals. Such studies are far, far removed from what happens in humans. Of the small amount of research done in humans, most just demonstrate improvements in antioxidant levels in the blood and subjective feelings of ‘well-being’. A common claim made about goji berries is that they have the highest level of vitamin C of all plants (some claims put it at up to 500-times that of an orange!). Such claims can only be described as make-believe. Independent analysis of goji berries shows they have the same amount of vitamin C as an orange. 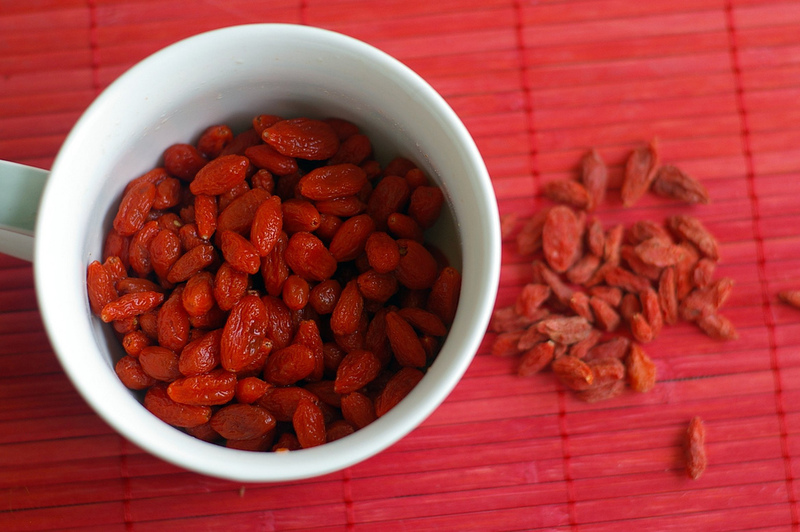 Goji berries offer no real special health benefits over more familiar berries such as strawberries and blueberries. Noni is a lime-green Polynesian tropical fruit. Noni fruit and juice derivatives have shown anti-cancer activity in rats and mice, but few clinical trials have been done in humans. One study in 2005, and only presented as a conference abstract rather than a published paper, looked at the effect of noni fruit extract (not juice) in cancer patients. No benefit was seen on the progression of tumours, though patients in the study did report a small improvement in the quality of their life. A single study found that patients given noni juice after an operation had less nausea. While the finding is interesting, the same benefit can also be achieved by taking common ginger. The results of independent CHOICE testing were damming for superfood antioxidant claims as the graph below shows. Compared to the antioxidant content of a red delicious apple, all of the juices tested contained only between 10 and 30% the amount of antioxidant capacity of a regular apple. I call that a fail for marketers of these foods who are making a tidy profit from the poor consumer hypnotised by their spin. 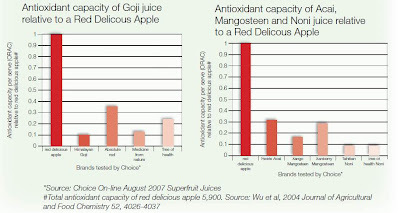 To gain the same amount of antioxidants found in a red delicious apple, you would have to consume five 30 mL serves of goji juice costing you a hefty $10. And it would take five 30 mL serves of noni juice, costing $7.50, to get the same amount of antioxidants as that found in a single navel orange. Clearly, on a serve-by-serve basis, many common fruits such as strawberries and apples, contain more antioxidants than heavily marketed ‘superjuices’, and are far cheaper. Beware of exorbitant health claims made about miracle exotic foods that have little scientific evidence to support them. Such claims are typically associated with expensive boutique foods. The fundamentals of a healthy diet, consistent with the Australian Dietary Guidelines, will give you close to the optimal health your body can achieve.